PURCHASE, NY, Feb. 26, 2018 — HIMSS Booth #3860 – Teladoc, Inc. (NYSE:TDOC) the world’s largest and most trusted provider of virtual care delivery services, announced today that it has been certified as a trusted partner of Surescripts,® the nation’s leading health information network. With this certification Teladoc expands its e-prescribing relationship with the organization, enabling Teladoc physicians to access the Surescripts Medication History and Eligibility & Formulary services. 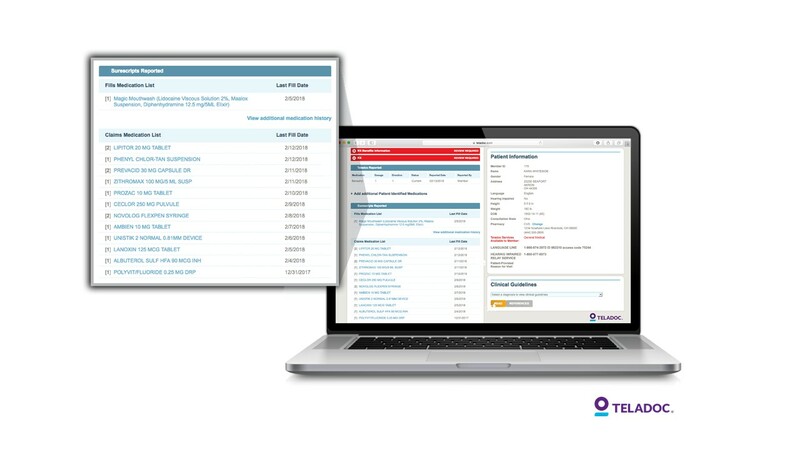 Real-time medication history validation and prescription benefit access at the time of consultation gives Teladoc physicians greater data insights that ultimately lead to improved medication adherence, reduced risk of potential adverse drug interactions, and lower prescription costs for patients. Being certified as a trusted partner of Surescripts is another example of how Teladoc continues to lead the industry in data-sharing across the healthcare ecosystem. With the ability to access real-time pharmacy information, to integrate into EMR systems, and to share medical records with primary care physicians, Teladoc goes beyond point-in-time care, to become a true part of the overall healthcare journey.